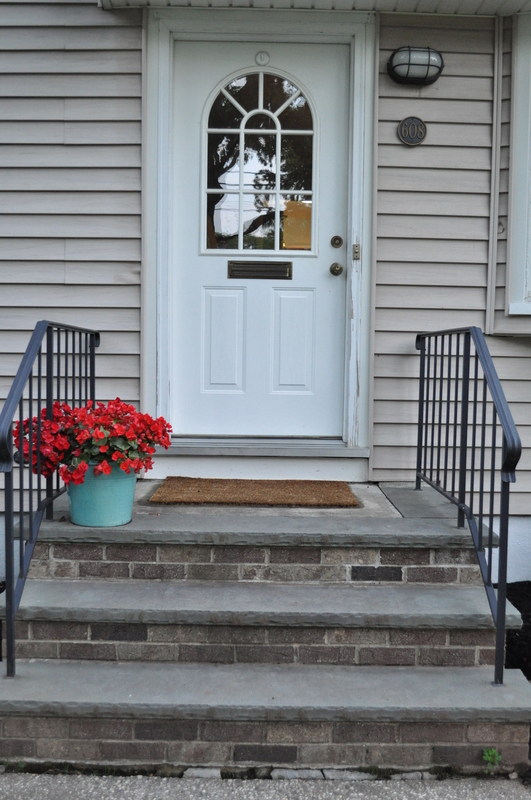 When I brought home some pretty begonias, I put them in two similar – but not exactly the same size – planters I had gotten last year at Home Goods. 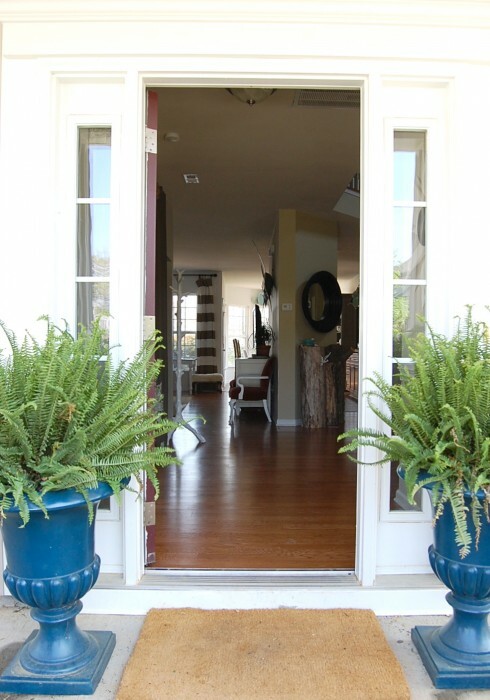 I put them on either side of the front door to make a nice symmetrical entrance way inspired by something like this. Do you see the problem? 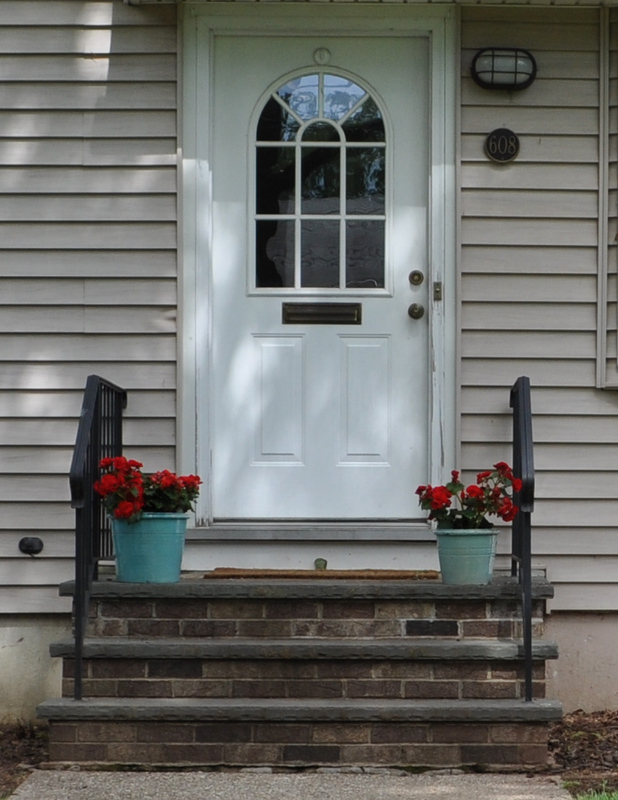 No, not the horrible door and the trim that needs to be painted and the lack of shrubs and the small scale of the flowers. I meant the planters. I was trying to not let it bother me that one pot was so much smaller than the other. But when I asked Sophia how the flowers looked and she said, “Mommy, why is that one so little?”, I knew I had to figure something out. I tried Home Goods for a match but you can imagine how that turned out. (I love a good Home Goods treasure hunt but the idea of finding something there that was there last year is a LONG shot.) So, when I saw some basic (read: Cheap!) 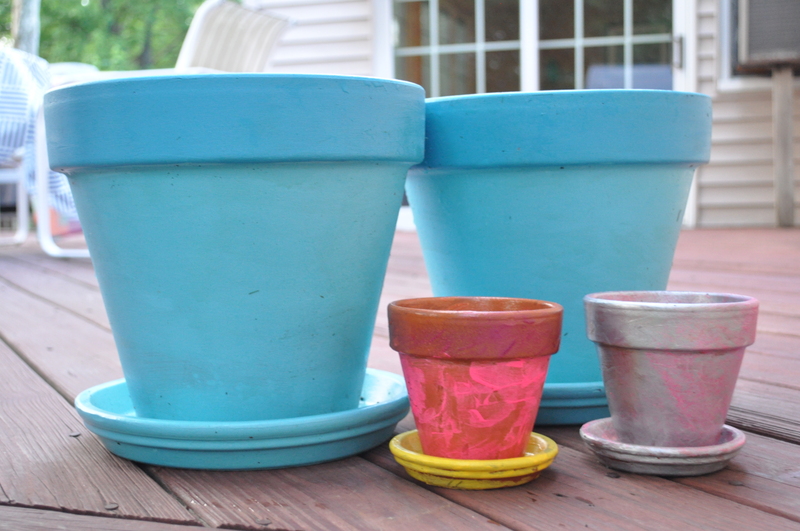 terracotta pots at Home Depot, I thought…I can do this. I can just paint it. A little google search told me to use acrylic craft paint and coat it with a polyurethane sealant. Since I had both laying around the house from old projects, I was able to pull this off for less than $10 each (the cost of the big pot and a saucer to go under it). I actually spent a little time on the afternoon of Mother’s Day just chilling on the deck and leisurely painting my pots. It was pure lazy-mom bliss, complete with a much deserved Twisted Tea. 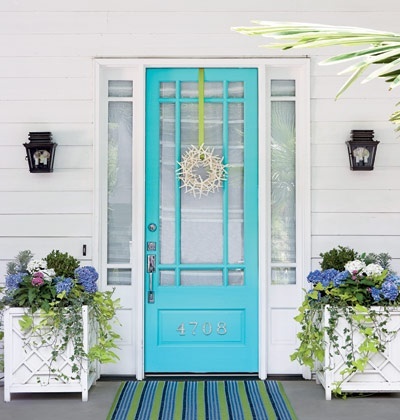 I started off with Craft Smart paint in “Island Blue” for most of the pot and Americana in “Calypso Blue” for the trim but I quickly decided that I needed something more turq for the trim and switched to Craft Smart in “Turquoise”. I’m sure you can see the drastic difference in the 2 colors as I painted Turquoise over Calypso blue. No, seriously, it was very dramatic in person. Ha. I had about 90% of the painting done when Lily decided to come and “help” me, so I let her paint the inside. The concentration. I love it. And since we’re keeping it real, here’s the facts: I wrote this post a month ago and I never got around to putting anything in the pots so I never finished it. Meanwhile, one of my plants out front died and now it’s completely asymmetrical. And for some reason, I don’t mind at all. My mother-in-law is coming to visit this week and I’m sure she’s bringing her green thumb with her. So, I have a feeling these pots won’t be empty for long. So, tell me…have you done any craft painting lately? With kids or without? How did it come out? Lily’s sunglasses: The Children’s Place. Sophia’s sweatshirt: Mini Boden from last year. Similar here. And P.S. Take it from me, if you have a few pots sitting in your backyard for awhile and you think you can just pick them up to wipe them down for a picture, just know that there is probably a slug inside one of them and you will touch it if you don’t pay attention.